Music for a Great Space, held in the nave of Christ United Methodist Church, is one of too few enterprising chamber music presenters in Greensboro. Its concerts feature regional and national talent that pair evening concerts with community outreach performances. Fifty percent of this concert's proceeds were shared with the Shepherd's Center, which serves the senior community. 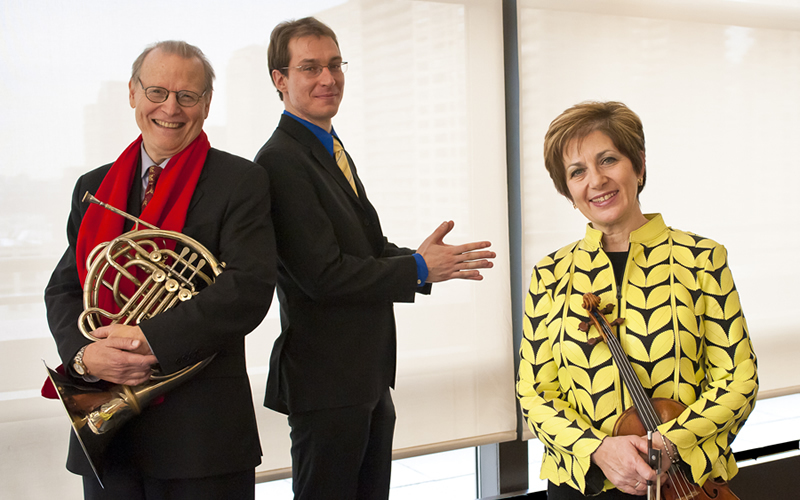 The featured ensemble was the Trio Valtorna, formed in 2011, which consists of French horn player David Jolley, violinist Ida Kavafian, and pianist Gilles Vonsattel. This was an intriguing work. The Valtorna players made the most of the contrast between the horn and violin in shared material. Balance among and between the baby grand Steinway piano, lid fully raised, horn, and violin was excellent throughout the concert. Vonsattel brought a colorful palette to the keyboard while Jolley's tone was colorful with wide ranging dynamics and precise intonation. Kavafian's warm tone was richly varied and her high harmonics ideal. About his Sonata for Violin and Piano (1923-17), Maurice Ravel (1875-1937) wrote that the work is for two "essentially incompatible instruments, which not only do not sink their differences, but accentuate their incompatibility to an even greater degree." It comes from a period in which he was abandoning lush harmonies in favor of stark, bare bones melody. It is in three movements: Allegretto, Blues, and Perpetuum mobile. Kavafian's and Vonsattel's interpretation and performance delighted in every way with their instrumental contrasts played to the hilt! Keyboard color was ravishing. Kavafian really dug into the strings. The wonderful Blues movement came off magnificently as both players "got down and dirty!" The pre-intermission program ended with the world premiere of Stillness and Velocity for horn, violin, and piano (2018) by Lawrence Dillon (b.1959). The University of North Carolina School of the Arts Composer-in-Residence's work is written in two contrasting movements entitled "Stillness" and "Velocity." This was not on the printed program. The work opened with dark musings by piano and violin before the horn joined with a yearning melody. The dynamics run the gamut and featured an ostinato keyboard figure supporting the violin's filigree. The "Velocity" movement was aptly named with rapid crossed hands on the keyboard, rapid violin bowings, and headlong notes from the horn. The music was, in turn, intense and full, with the pungent horn contrasted with sparely scored passages as well as ppp violin and long held horn notes. The 11-minute work will repay frequent hearings and I hope it will join Dillon's growing discography. The great Horn Trio in E-flat, Op. 40, by Johannes Brahms (1833-97) was begun a few months after the death of his mother in the spring of 1865 and premiered on December 5 with the composer at the piano. It is in four movements; Andante, Scherzo: Allegro, Adagio mesto, and Finale, Allegro con brio. Brahms used a German folksong, "In der Weiden steht ein Haus" (In the Meadow Stood a House), near the end of the third movement and extensively in the lively Finale. The Valtorna Trio players brought out the lyricism of Brahms' unusual Rondo Andante as they alternated in turn between a graceful, flowing theme and a more agitated second theme. The mellow, warm tones of Jolley and Kavafian were firmly supported by Vonsattel's clear rhythms. Jolley brought out the ringing quality that evokes hunting horns in the Scherzo and in spades in the Finale. Kavafian maintained good intonation in face of the last two movements' challenges. The bittersweet and brooding mood of the Adagio was captured perfectly by all three players. The exultant, headlong racing evocation of the hunt was vigorously evoked in the Finale.